Fenimore Cooper’s Romantic epic of the West takes place in upstate New York, of course, in 1757. It’s where and when the wild west begins in The Last of the Mohicans. The 1936 version of the classic is extremely well-done, but has what you might expect from a studio version in the black & white age. The American Indians (before becoming Native Americans) are played by actors with fair skin and blue eyes. This is particularly noticeable for the most noble of all American Savages, Chingachgook. The last of the bad Indians, Magua, is played terrifically by underrated Bruce Cabot, fresh off fighting as a stalwart hero against King Kong. This time he is barely recognizable with his Mohawk haircut and bare midriff. He is sullen, dangerous, and quite impressive. The King Kong hangover continues for him. The musical score for the film is a rip-off of the overwrought music for the giant ape. In several sequences, Cabot seems to be re-enacting his other role on Skull Island in native garb. His foil is Randolph Scott as the first true rifleman, Hawkeye. And, no one could be better in the role, as the actor shows early on his subtle humor in the part. One of the truly odd changes is the reversal of Alice and Cora, the two daughters of the regiment. In the original story, Cora is dark-haired and tempestuous. She is called Alice here, and her blonde sister becomes Magua’s obsession. In Cooper’s book he appreciates her dark looks, not her blonde locks. The story is further muddled by putting the key scenes with the last Mohican somewhere earlier in the plot—and ending with some kind of court-martial of Hawkeye. It doesn’t matter too much, as this turns out to be a pleasing version overall, hitting on the key moments of the story and casting truly fine actors. Randolph Scott was a rich man’s Audie Murphy. In the 1950s, all the good western B-scripts were sent to Scott. Those he didn’t want went to Audie. As a result, both cowboy star actors made half-a-dozen fascinating and memorable Westerns in the late 1950s. Many of the films were made with legendary Budd Boetticher as the director. His sense of what made a Western great made for great western drama that transcends cultures and times. That brings us to a re-viewing of Seven Men from Now, a revenge tale perfectly suited for Randolph Scott who was then in his late fifties with steely gray hair replacing his blonder locks. 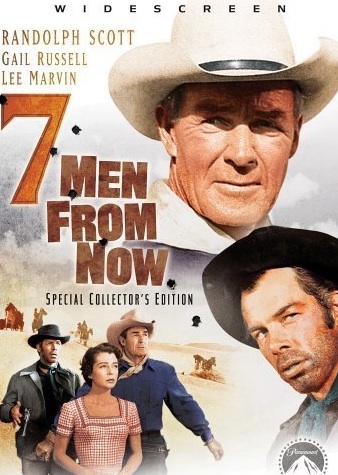 Seven Men from Now also featured Lee Marvin, already in cross-over mode and ready to costar with Wayne in Donovan’s Reef and The Man Who Shot Liberty Valance. He was always a dangerous bad guy in movies, but was making waves that would finally send him into leading man territory within a few years. The female lead was another personality on the ashcan perimenter of Hollywood, Gail Russell, who had also made some movie history with John Wayne, but was on the downslide to oblivion and premature death. Here she is slightly disturbing as a “good wife” to another man. By today’s standards, Scott’s revenge at taking down seven killers responsible for a heinous murder is rather tame—except for the hero’s steely resolve. It is not the best of the Scott Westerns of the era (see The Tall T), but at 75 minutes, it is short and stunning. Movie insights from Ossurworld’s Dr. William Russo can be found in his books like MOVIE MASHUP and MOVIES TO SEE–or NOT TO SEE! All Russo’s books are available at Amazon.com in softcover and in e-book formats.